(i) A minimum of two partners who can be Individuals or Body Corporate through their nominees. (ii) Of the total number of partners, atleast two shall be Designated Partners, of which at least one must be an Indian Resident. (I) Every Designated Partner is required to obtain a DIN from the Central Government. If a person already has a DIN, the same can be used for forming LLP. (ii) For the purpose of signing the forms (e-Forms 1, 2, 3 etc. ), the Designated Partner of the proposed LLP need to obtain a Digital Signature Certificate (DSC) from government recognized DSA’s. The signatures shall also be required for signing and filing of all relevant forms and documents to be filed, annually or event based after incorporation of the LLP, asking for approvals or as intimation. (i) The next step is to decide the name for the proposed LLP to be incorporated, anyone intending to incorporate an LLP has to evaluate his proposed name under the prescribed parameters and make an application in Form 1 of Rule 18(5) of the Limited Liability Partnership Act 2008, for reservation of the desired name. (ii) The name of the limited liability partnership shall not be similar or identical with Company or LLP already registered in India and it should not contain words prohibited under the ‘Emblems and Names (Prevention of improper use) Act, 1950’ or which are also not ‘Undesirable’ in the opinion of Central Government or which satisfies the conditions prescribed under rule 18(2). For more information check Name Availability Guidelines. (iii) In case any Body Corporate is partner, copy of Board resolution authorizing the incorporation of LLP shall be attached. (i) The next pertinent step is drafting of Limited Liability Partnership Agreement governing the mutual rights and duties among the partners and among the LLP and its partners. (iii) In case no agreement is entered into, the rights & duties as prescribed under Schedule I to the LLP Act shall be applicable. 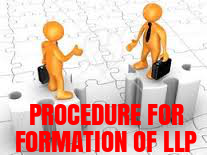 (iv) It is not necessary to have the LLP Agreement signed at the time of incorporation, as the details of the same needs to field in e-Form 3 within 30 days of incorporation but in order to avoid any dispute between the partners as to the terms & conditions of the agreement after the formation of LLP, it is always beneficial to have the LLP Agreement drafted and executed before the incorporation of the LLP. (i) After the Registrar is satisfied that all the formalities with respect to the incorporation has been complied, he will issue a Certificate of Incorporation as to formation of the LLP within maximum of 14 days from date of filing of documents.